A few weeks ago, when visiting one of my favorite art galleries in Atlanta (Pryor Fine Art), one of the employees of the gallery told me that they had just received early release copies of the premiere issue of the Scout Guide Atlanta, and they let me take one home with me. Pryor Fine Art is featured prominently in the new guide – no surprise as it is one of the best galleries in town. I had not heard about the Scout Guides (there are Scout Guides for over 25 cities around the US) but my experience with the Atlanta guide has been an excellent introduction. It is full of thick, superb quality, beautifully photographed pages that feature a highly curated group of many of the best shops, artists, and artisans in Atlanta. In a world in which so much is online, it is nice to see so much thought put into a tangible guide that can be used as a reference time and time again. Page after page of my favorite businesses and design firms in Atlanta are featured, and there are many names that are new to me. A few days after my introduction to the Scout Guide Atlanta, Christy Ford (one of the founders of the Scout Guide) contacted me to ask if I would be write a guest post on the Scout Guide blog about some of my favorites from the Scout Guide Atlanta. Click here to see my guest post on the Scout Guide blog, or visit http://thescoutguide.com/guest-blogger-things-that-inspire/. I would love it if you come over and read my guest post! 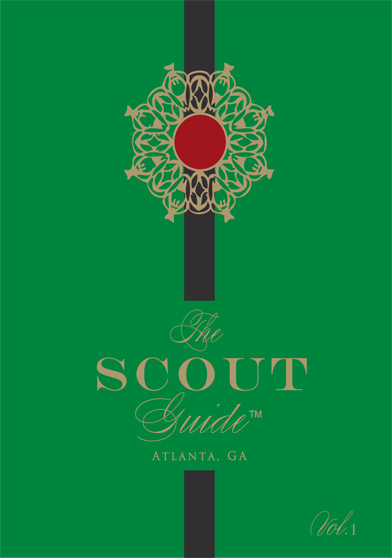 The Scout Guides are available at select venues throughout the cities that are featured; they can also be purchased online through the Scout Guide store. Greg Irby is my favorite art gallery. The Pie Shop is also a hidden gem. Is the Scout Guide online? Holly these are wonderful. I wish they had on for the Kansas City area, there is so much to do and see. The museums and galleries are superb. The publication would be such a nice gift for visitors or those new to the area! The minute I heard about this, I knew they would be a hit, what a fabulous idea. I will absolutely go over and read your post...how neat that they asked you to write it!! Enjoy your Sunday Holly...hope its a lazy and relaxing one and that sun is shining!